Welcome to our Technical Information resources page where you will find articles that'll help you with your spring design or help you get around The Spring Store website by explaining what we offer and how it works. Our design articles will help you discover things like how to measure your spring, how to calculate spring rate, and how to calculate your working loads based on your spring rate. 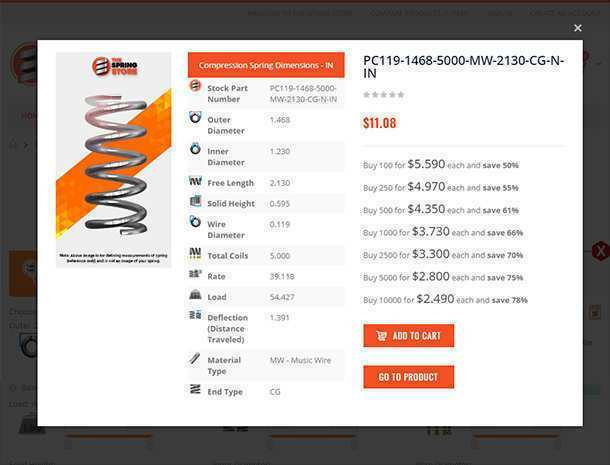 Other articles talk about the prodcuts we have to offer as well as the tools provided on this site to help you find your springs fast or generate a custom spring instant quote. Click on a link under a subject you're interested in to learn more about that subject. Compression springs are also known as coil springs. They are open wound linear springs because they have the same amount of pitch between each one of the coils. Learn about their dimensions, specifications, and how they work. Extension springs are also known as tension springs. They are close wound linear springs because there is initial tension keeping the coils together as to be pulled apart. Learn about their dimensions and how they work. Torsional springs are also known as torsion springs. They are close wound rotational springs with legs on the ends because they deflect radially under torque. Learn about their dimensions, specifications, and how they work. Conical springs are also known as tapered springs. They are non-linear compression springs for they are open wound but have variable coil diameters. Learn about their dimensions, specifications, and how they work. Spring rate is the proportional amount of force per one unit of distance traveled. This is what makes compression and extension springs linear. Learn about the formulas, calculations, and how spring rate works. Spring design is very extensive since there are several subjects to learn about per spring type. Below you can find general design information for the three main spring types; such as formulas and explanations on how everything works. What is a Coil Spring's Diameter? Shopping for springs on a mobile device? Give us a call for assistance! 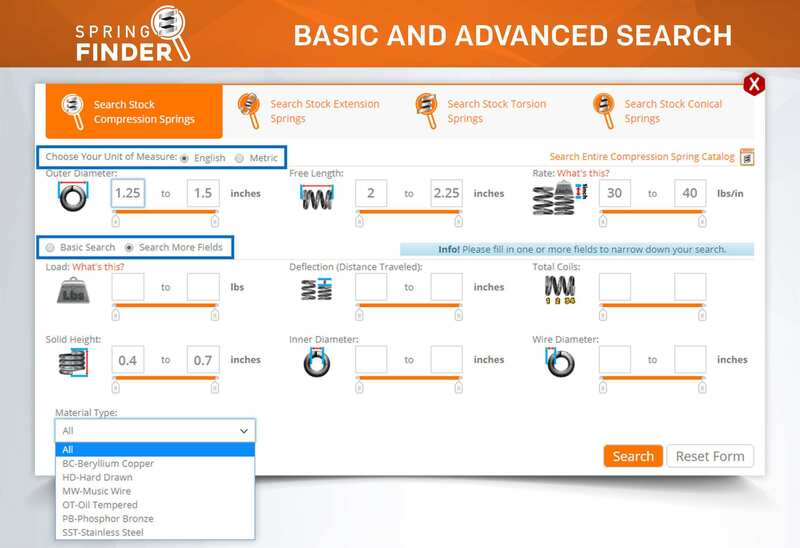 Find and buy stock compression springs in two simple steps using Spring Finder. 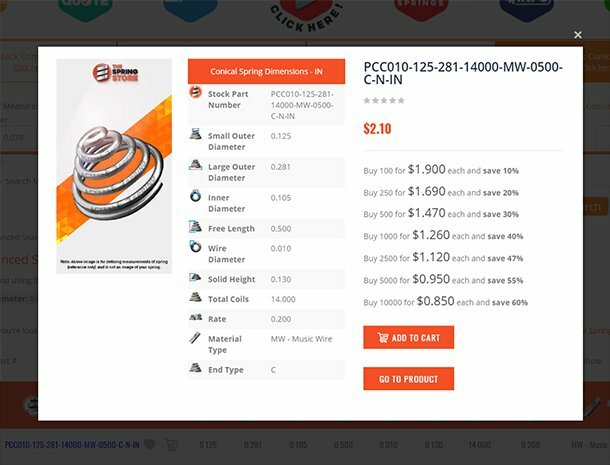 This easy to use search engine makes it easy to find and buy the stock spring you need. If you are interested in buying a stock compression spring, you must know what you require your spring to do and where it will have to fit. 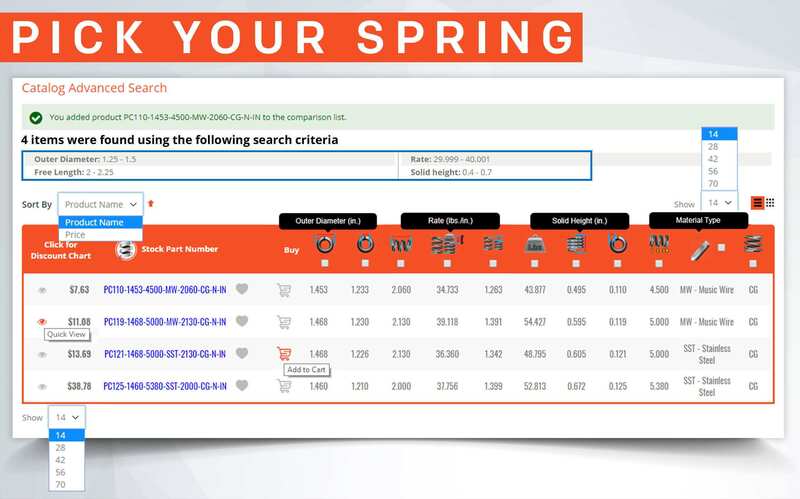 Spring Finder is divided into a basic search and an advanced search. You can choose to search in English (inches and pounds) or Metric (millimeters and Newtons) units of measurement. The fields provided in the finder each correspond to a particular spring specification. Each dimension has two input boxes so you can select a range. These are the limitations you want to set so that the search can provide results within those tolerances. Once you’ve entered your spring’s specifications, click “Search”. 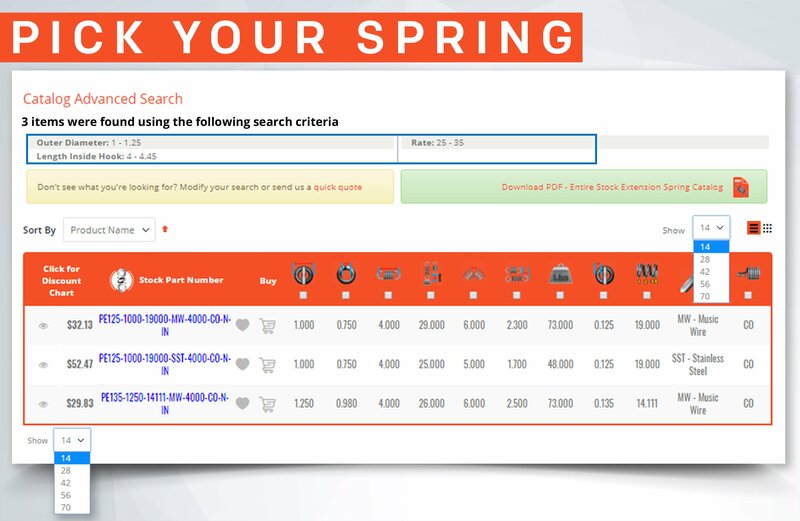 After you have clicked “Search” on the Spring Finder, you will be directed to a page of results. The number of results you will get depends on the dimensions and ranges you entered. You can choose to view from fourteen to seventy results in one page and you can choose whether to view them in a table/list or side by side as products in grid format. Besides choosing the quantity of results you want to view, you can also organize them based on the specification of your choosing. After sorting the products in the order of your choosing, you can start looking through the list to decide which spring will work best. You can find the spring based on the maximum load or the maximum deflection. When you find the spring that meets your load and travel requirements, you can then check whether the spring rate meets your working loads. 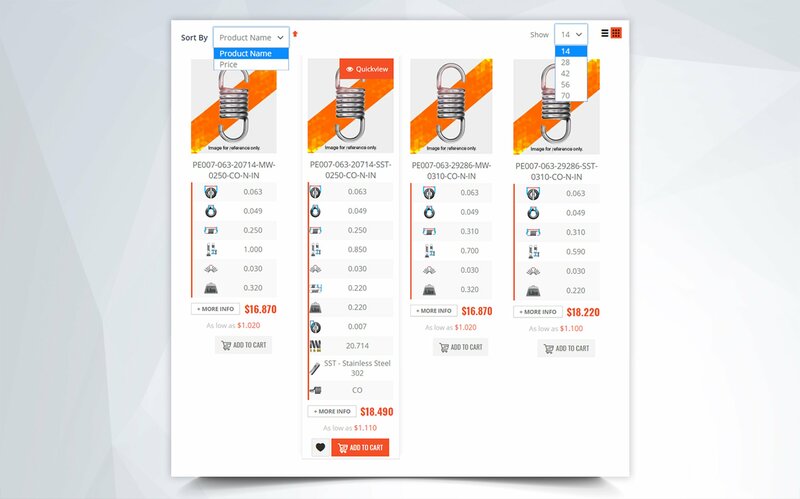 Furthermore, you can check pricing at different quantities by clicking on the Quick View icon. 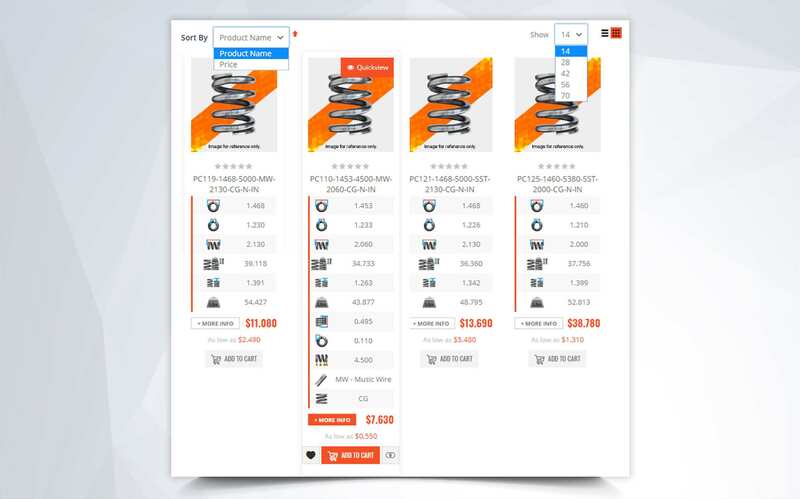 If you still need help deciding select your springs and “Add to Compare” by clicking on the icon of two circles joined together on each product. This is to be able to compare them side by side in a more efficient manner. To enter the Compare Products page, find the link at the top of the page. Then, just quickly add them to your cart to complete your order. If you need further assistance finding your springs, you may contact our team of experts to help you out. Our engineers can help answer your questions and assist you in finding the correct spring for your application. 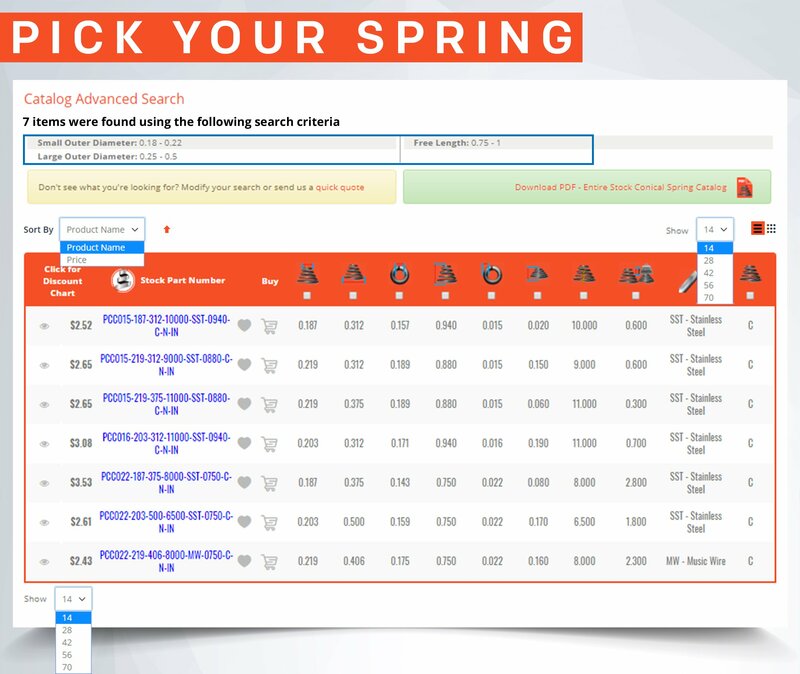 Find and buy stock extension springs in two easy steps using Spring Finder. This simple tool makes finding the stock tension spring you need a fast and productive task. Search through over 4,000 designs off the shelf. When searching for a stock extension spring, you base your search on its parameters and tolerances. We do have thousands of springs in stock but, most likely, you will find springs similar to yours, not exact replicas. 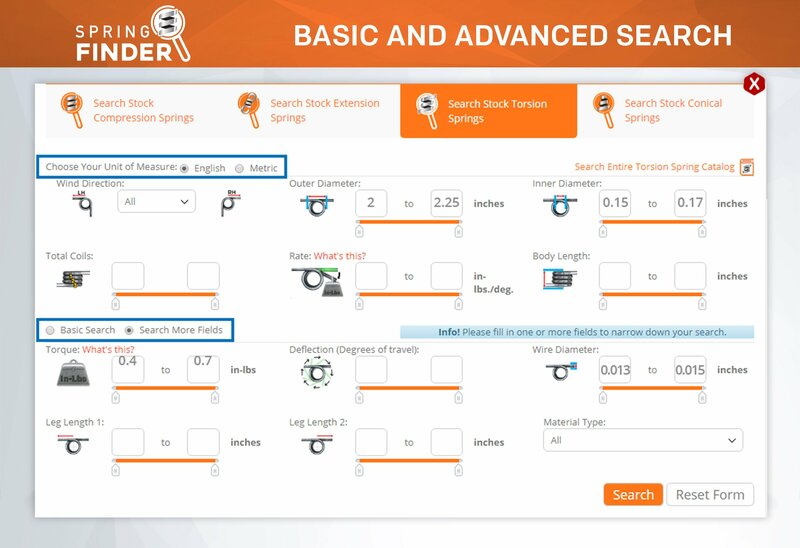 Spring Finder will allow you to search for your springs in both english and metric units. Initially, it gives you three parameters to search your spring by but gives you the opportunity to expand it into a more advanced search where you have more parameters to choose from. Next to each dimension, you will see two input boxes where you can enter your max. and min. 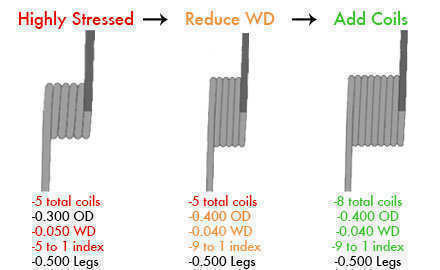 tolerances for that specific parameter. The fields are not mandatory so you can choose whatever dimension you feel needed and click “Search” once you have done so. After clicking “Search” on the Finder, you will be directed to a page of results. These results are displayed in a table/list as default but you can select to view them in a grid format where they will be shown side to side. The amount of results you get will depend on how many dimensions you entered and how tight or loose the tolerances are. Based on how many results you generate, you can also choose to show from fourteen to seventy products per page. 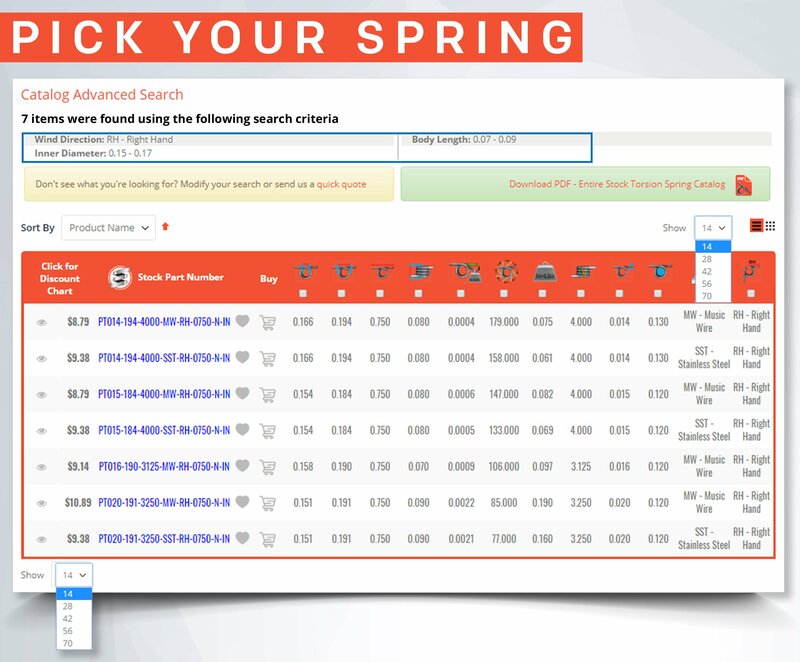 After you have figured out how you want to display the results of your Spring Finder search, you can begin finding potential products based on the suggested max load and deflection/travel, as well as the spring rate. Select all of your potential springs and “Add to Compare”. Scroll to the top of the page once you have done so and click on “Compare Products” where they will be displayed side to side. Check out pricing at different quantities by clicking on “Quick View” or click on the part number to be directed to the product details page. Having a hard time finding what you need? Feel free to contact our sales and engineering teams for help on design or finding your extension springs. 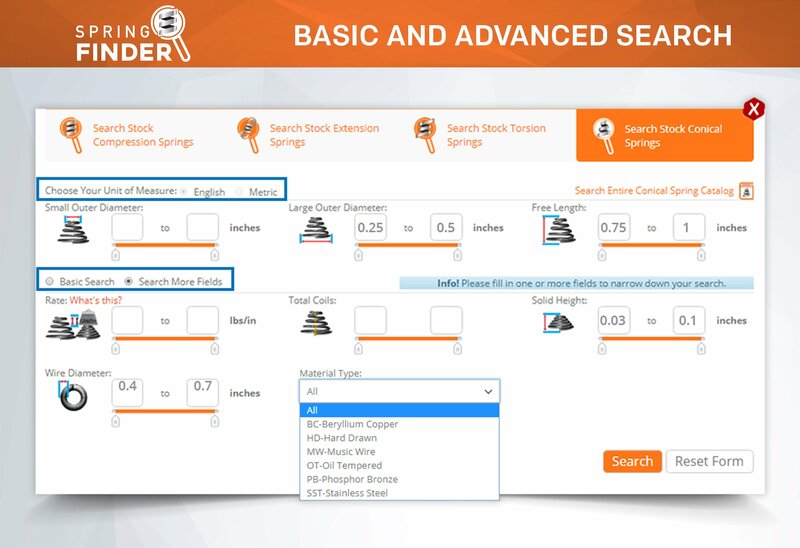 Find and buy stock torsion springs in two easy steps using Spring Finder. This simple tool makes finding the stock torsion spring you need a fast and productive task. Search through about 1,000 designs off the shelf. When searching for a stock torsion spring, you base your search on its parameters and tolerances. We do have hundreds of springs in stock but, most likely, you will find springs similar to yours, not exact replicas. Spring Finder will allow you to search for your springs in both english and metric units. Initially, it gives you three parameters to search your spring by but gives you the opportunity to expand it into a more advanced search where you have more parameters to choose from. The fields are not mandatory so you can choose whatever dimension you want and click “Search” once you have done so. Having a hard time finding what you need? Feel free to contact our sales and engineering teams for help on design or finding your torsion springs. 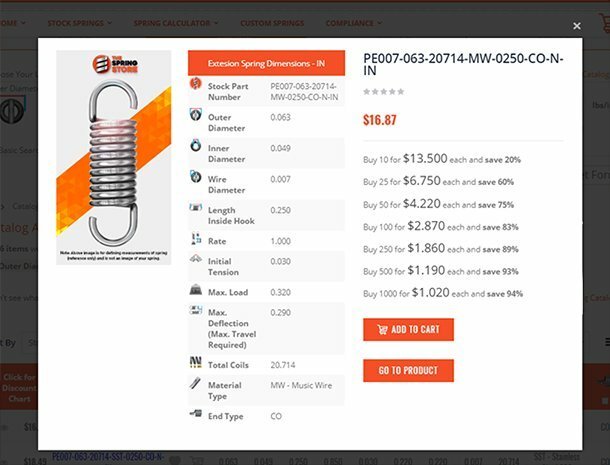 Find and buy stock conical springs in two simple steps using Spring Finder. 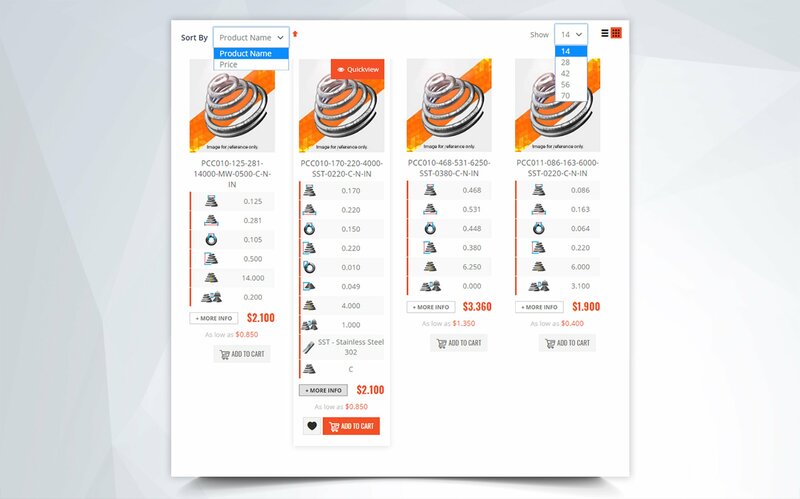 This easy to use search engine makes it easy to find and buy the stock spring you need. If you are interested in buying a stock conical spring, you must know what you require your spring to do and where it will have to fit. 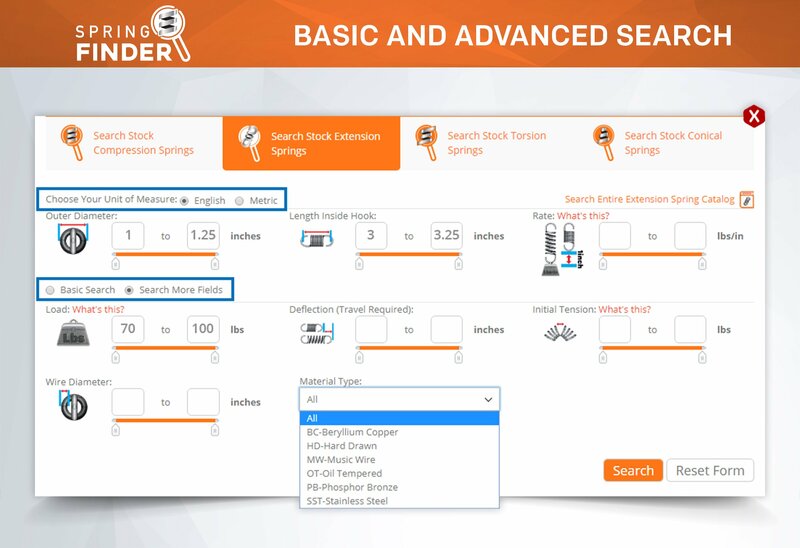 Spring Finder is divided into a basic search and an advanced search. You can choose to search in English (inches and pounds) or Metric (millimeters and Newtons) units of measurement. The fields provided in the finder each correspond to a particular spring specification. Once you've entered your spring's specifications, click “Search”. After you have clicked “Search” on the Spring Finder, you will be directed to a page of results. The number of results you will get depends on the dimensions and ranges you entered. You can choose to view from fourteen to two-hundred-and-eighty results in one page and you can choose whether to view them in a table/list or side by side as products in grid format. Besides choosing the quantity of results you want to view, you can also organize them based on the specification of your choosing. After sorting the products in the order of your choosing, you can start looking through the list to decide which spring will work best. You can find the spring based on the average rate or the most important dimensions to you. When you find the spring that meets your load and travel requirements, you can then check whether the spring rate meets your working loads. 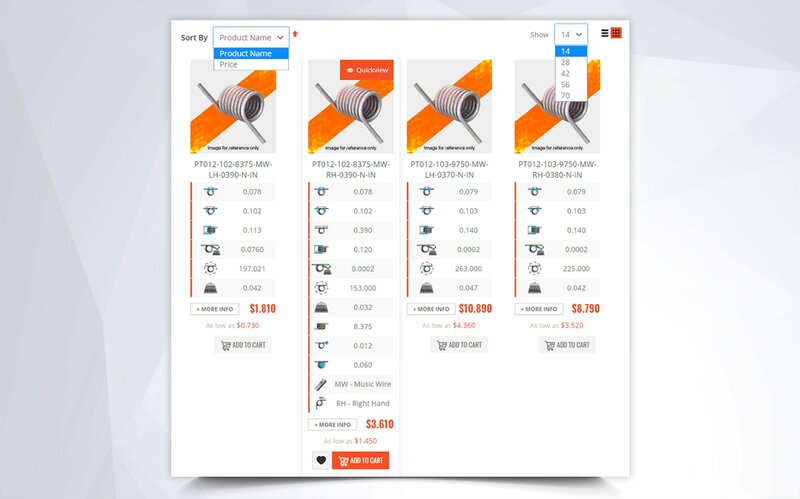 Furthermore, you can check pricing at different quantities by clicking on the Quick View icon. Definition: Torsional springs which are either light in weight due to their small or average size, or have dimensions which make it a light spring in terms of torque. A light torsion spring is a spring that might have a small or average wire diameter paired with an outer diameter that corresponds to a spring index no smaller than a 7 to 1 spring index. This means that the coils aren’t wound too tight so it is under less stress. In the examples to the right you are able to see the difference between spring designs according to the proportion of its physical dimensions. One of the springs is under a lot of stress since it has a small index and little coils. This spring will not be as flexible to travel and it is also very strong. The next spring has an average index with an average amount of coils which now makes it a lighter spring. The last spring also has an average spring index but has less coils. This spring will be stronger than the previous spring but having an average index, it is under much less stress than the first spring so it will be able to give you more elasticity and more force. The second spring is a light torsion spring in rate while the last spring is a light compression spring in both rate and weight. This is because, since it has less coils, it requires less wire to be manufactured and less wire equals less weight. That is the case of the first torsion spring; It is under a lot of stress and it is also very strong but it is a lighter spring in weight since less wire is required to make a full coil. When picking a light torsion spring, it is merely a matter of perspective; whether you want a light compression spring in rate or in weight. 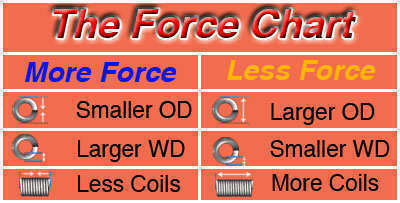 The force chart lets you know how you can make a torsion spring's rate per degree stronger or lighter. To make your spring stronger you may manipulate the spring index by making either the outer diameter smaller or the wire diameter larger, taking coils out, or creating more torque through more travel by altering the free position. To alter the free position angle of your torsion spring, you must basically take out part of the last coil; in doing so, you’re also making the spring stronger. Once you’ve taken a partial coil out, your spring will require more torque in order to reach your degrees of travel because it will have to undergo more travel. 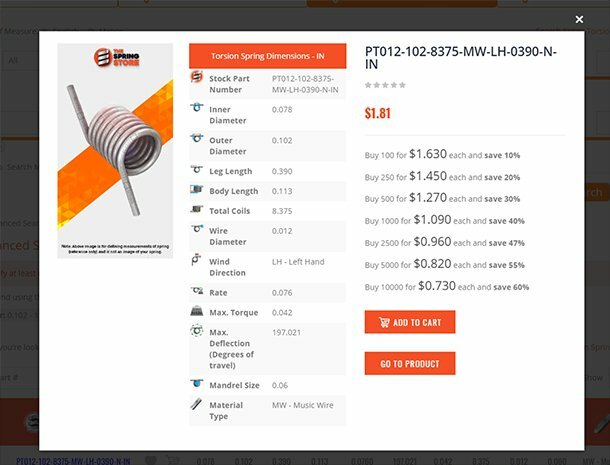 To make your torsion spring lighter, you can manipulate the tightness of its coils by either decreasing the outer diameter or decreasing the wire diameter. You may also add more coils or produce less torque through less travel by altering the torsion spring’s free position angle. In this case, you would add a fraction of a coil so that your spring has to undergo less torque in order to meet your required torqued position. In terms of weight. A light torsional spring will be more effective on applications where weight plays a factor. As an example are aerodynamic applications. Having a light torsion spring will not be applying much weight on your application thus helping it work accordingly both in completing its task as a spring and still allowing it to be a light instrument. These springs will also be more economical in terms of manufacturing and shipping expenses. The manufacturing will be cheaper because less material will be needed to make the springs. The shipping will be cheaper because your package will weight much less. International Shipping is available for most countries, if you do not see yours in the checkout please contact us for pricing. Copyright © by CompressionSpring a Division of Acxess Spring. All Rights Reserved.